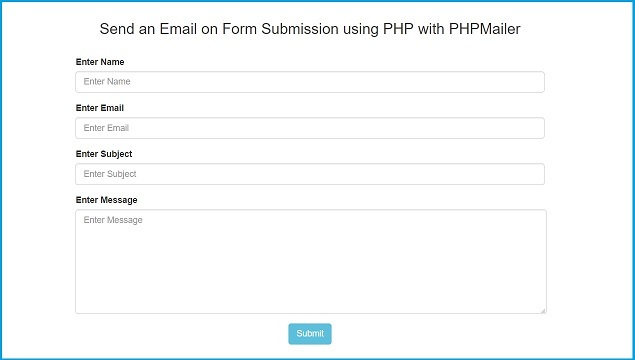 Sending of an Email is most required feature of any Website for connect user to system, so in this post we have discuss how can we send email on form submission by using PHP script with PHPMailer Library class. PHPMailer class is an other alternative of PHP mail() function to send an Email by using SMTP settings. If you have an Email hosting account then you can use this PHPMailer class for send an email from your website by provide SMTP credential. In this post we have learn how can we send email from localhost in PHP script by using PHPMailer. If you have use PHP mail() function for send an email then you have to set Email configuration in your php.ini file but if you have use PHPMailer class then you can use any Email hosting account for send an email on form submission or any event in your website as you set. Here we will learn how to use PHPMailer in PHP and how can we configure into our PHP script or form submission event. For use this class we have required SMTP username and password and we also know SMTP host server name also. If you do not know, so please collect this information first for use this class, without knowing this information we can not configured PHPMailer class into our web application. If we have successfully configured SMTP settings then we can send Email via SMTP server in PHP using PHPMailer. In this post we have make simple contact form for user to send his or her feedback to owner of website via Email send using PHPMailer.